Oh, the fun things my children say…. While I was preparing this dinner a couple nights ago, my boys were sitting on the counter watching as I chopped up the veggis to go with the Couscous. My oldest son took one look at the yellow squash, got a weird look on his face and asked, “Mommy, is that a poisonous monster?” I think that was my first sign that this dinner wasn’t going to go over so well with my boys! Fresh, healthy and full of flavor were my thoughts, however, to my boys it was, “I don’t like those yellow things”, “I hate tomatoes” and “Are you trying to poison me with this monster?” They both had a few bites, but my favorite line of the night was, “Mommy, this looks like something only YOU will eat!” My boys are so funny, I’m just hoping the new veggis will grow on them someday! This was another farmer’s market dish that cost pennies to make. My husband and I loved it and I had the rest for lunch the next day. Head out to your local farmer’s market and make yourself a big bowl of fresh garden vegetable couscous, in hopes your kids will not think you’re trying to poison them with the creepy squash monster!! 1. Prepare couscous according to package directions. Set aside. Place olive oil into a large sauté pan over medium heat. Saute squash, leeks, green beans, corn and tomatoes for 3-5 minutes or until softened. Stir in garlic for 60 seconds then season with desired salt pepper and garlic salt. Stir in cilantro leaves and cooked couscous. 2. In a small bowl whisk together the olive oil, mustard, salt and pepper. Pour over couscous and stir to combine. Serve warm. There were no complaints from the little guys with this dinner. The boys loved the fun pasta shape and had no idea I snuck some veggis in the sauce. Quick, easy and on the table in about 20 minutes. I’ve become a huge fennel fan these days. 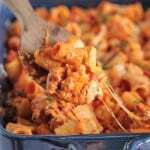 Give it a try, I don’t know what I was afraid of, it gives such a great flavor to so many dishes! Hope you’ll enjoy! 1. Prepare pasta according to package directions. Drain and set aside. Heat the oil in a large sauté pan over medium heat. Saute onion, fennel and salt for 3-5 minutes or until softened. Stir in beef , salt, pepper and garlic seasoning; cook until browned. Stir in pasta sauce, basil leaves and cooked pasta. Season to taste. Simmer on low until ready to serve. Huge thanks to Lisa over at Living Easy for the Brilliante Weblog Award! She has a wonderful, smart eco friendly blog, do check it out. Thanks Lisa!! Coming up is a fancy turkey club sandwich that tastes like a million bucks and more ways to jazz up those veggis! Enjoy the rest of the week! Looks like something I would eat! Both dishes look delicious. I just bought some of the Ditalini pasta. Have never used it before..but now I know one way! Looks FABULOUS to me! Now I know what to do with the pile of little tomatoes I pulled out of my garden yesterday! Of course, I’ll be the only one in my house eating it, but what else is new. looks great. the ditalini pasta looks really good. how cute you little boys get to be right there when you cook/bake. oh both these recipes look good! i’ve never used fennel before, but your kids ate it?? i’ll have to try it now. it’s the kids you have to cook for, if they don’t like it you might as well forget it, but most of the time they’re pretty good about being my test testers for new recipes,it’s daddy whose the snoop!! Your kids are funny! I think it looks delicious! Congrats on the 3 a day menu! Your menus sound really good! Yum! 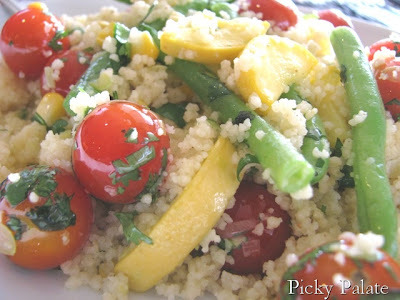 You’re couscous looks wonderful! I really liked the ditalini pasta, have fun making something good with it! I don’t know what it is about tomatoes and kids. For some reason they just don’t like them! Hope you have fun eating them all to yourself! I try to have them in the kitchen with me often, however some days they are too crazy! You’ll be first on my list Sharon! I would really recommend trying fennel. It gives a nice fresh homemade taste to the ol’ storebought pasta sauce! Isnt’ that the truth Prudy! Glad to know you and I would have a fab time eating our couscous! My kids take honesty very seriously and don’t spare a word! I get an earful everyday from my 2! Glad your little one’s enjoy couscous! Maybe if I put pepperoni’s in it, mine would eat it! So cute! I too have never tried fennel before. I’ll have to be a little more adventurous. I’m sure your kids will learn to like vegetables, especially if you keep cooking them so nicely like that! 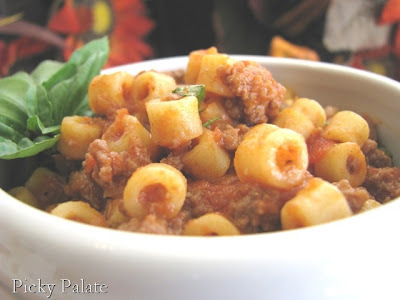 The ragu looks great as well, I love the shape of that pasta! It would be fun to have a cooking buddy as a neighbor. I’d probably get nothing done around the house, but we’d have a great time eating! Definately give fennel a try, I love it sauteed in so many recipes. I’m certainly going to keep those veggis coming, my boys are bound to like them eventually! I’m cracking up! Kids are so funny! 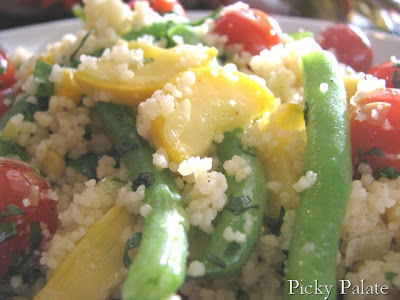 The couscous looks fantastic, that is my kind of dish! I LOVE fennel…but I have only eaten raw in salads, I’ve never actually cooked with it, I’ll have to try it out. I’m such a food addict and love your blog! Boys can be picky eaters! My 12 year old just came around to trying new things! Love cous cous can’t wait to try! I just bought several boxes at Costco! 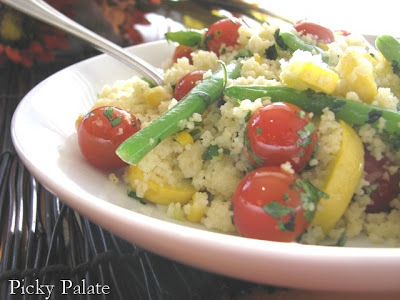 Yum… I’m stashing all these fresh veggie recipes away until harvest time. Sometimes it stinks living up north where I have to wait clear into August to get my hands on fresh stuff. But this really looks good. Can’t wait to try it… in August. Your pictures are beautiful! The red, green and yellow really pop! I think your boys will grow to like this, eventually. Kids are so funny. 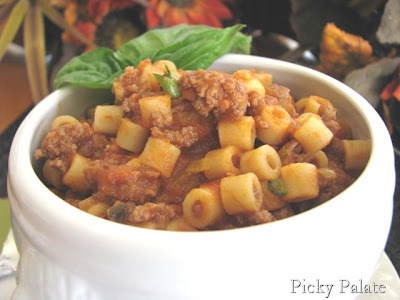 The beef and pasta look good and comforting. Never mind the kids, its usually my hubby that comes out with a line like that! – He’s got a lot to learn. I think I’ll try the fennel in a salad next. I bet it’s terrific! Thanks for the comment! I hope you’ll enjoy the couscous. I just tried to find the boxes at Costco last night and had no luck! Drats. You’ll have a whole slew of recipes to try! I’ll keep working on my boys! Who am I to talk, I didn’t like my veggis until I was in my late 20’s! My husband can be the same way! 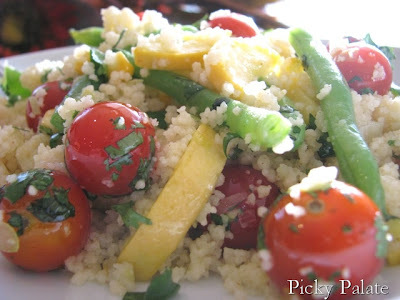 I wanted to let you kow that I featured your couscous recipe & your blog on my blog this Thursday for Too Hot To Cook Thursday. That salad certainly does look fresh and good! You inspire me to cook more healthy for my family. Hop over to my blog I have a gift for you. hey jennie! i made something on my blog from you! Thanks so much for posting my recipe on your blog, you’ve got a great blog! Thanks for the award this mom! I actually go into Mesa. It’s the Superstition Market on Main street between greenfield and higley on the south side of the road. It looks great, glad you liked it! Nope..my kids wouldnt eat it either! But I would scarf it up! This made me laugh out loud. Too cute. It looks like something I would eat. I am glad to know that I am not the only mom that gets horrible comments from her kids about the food! I will definitely take some it looks delicious! I want to give this one a try. I ave never used fennel before. It sounds delish. hahaha.. that’s a great line! Maybe your kids will make fine comedians. Don’t worry, someday they will love all that stuff. Looks delicious to me! Thats to funny. As a kid I was scared of squash as well but now I love it. This all looks so good, great job as usual and I can not wait to try it. 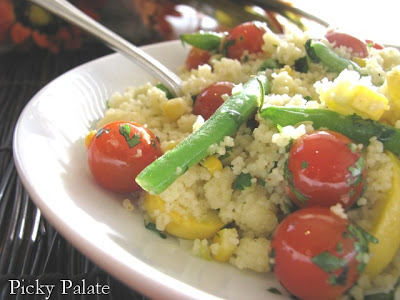 It is about th same comment that I would expect from my children, but the rule around here is that they must 1 teaspoon full…then they can pass a judgment… This mommy however would enjoy this delicious cous-cous salad. These recipes look great, and that first one looks terrific to me! My kids have been known to look in the skillets and pots on the stove and after asking what I’m making, they then say, ever so sweetly, “what are the kids having?”. This is a great one! Love the fresh vegetables. So summery! I always think that I’m not a fennel fan, so I should try this to see if that’s true! And I love the veggie dish – I’m not afraid of those monsters! Sounds like something my boys would say… if only I could get any of my family to eat couscous! I love it, but them – not so much. Thanks for helping me overcome my fear of the fennel bulb!